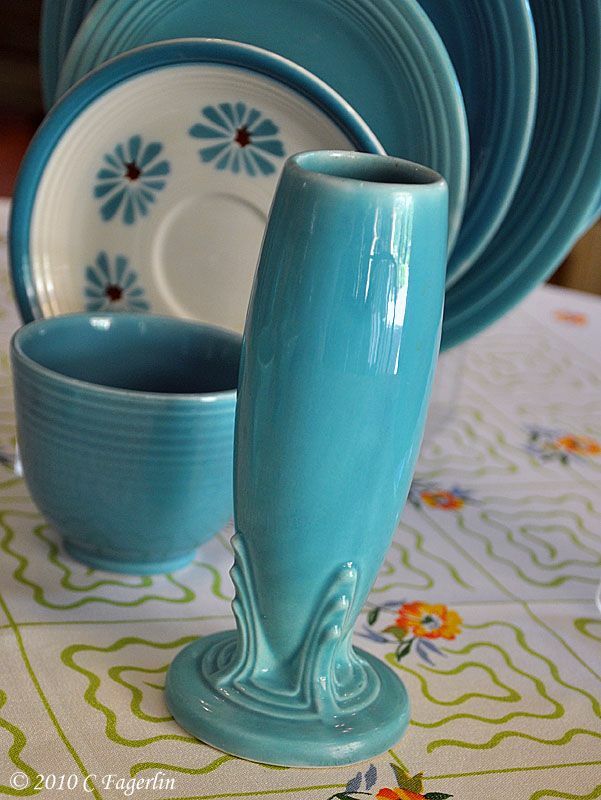 Welcome to another Vintage Thingies Thursday hosted by Coloradolady! Come see all the vintage goodies linked up for this weekly event. Last week I shared some of the vintage Fiesta Ivory pieces from my collection. The first five colors introduced in 1936 were Ivory, Red, Blue, Yellow and Green. the line over the years. 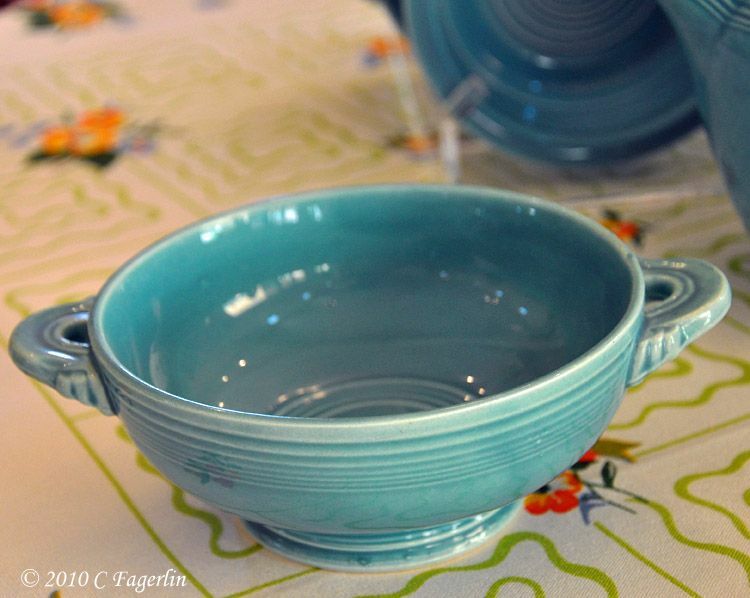 and their dinnerware lines on another one of my blogs The Pottery Papers. some were also shown in Ivory last week. This is a shape that has not been reproduced in the Post 86 Fiesta dinnerware line. of the fruit bowl, and the Tom and Jerry Mug (aka ring handled mug). 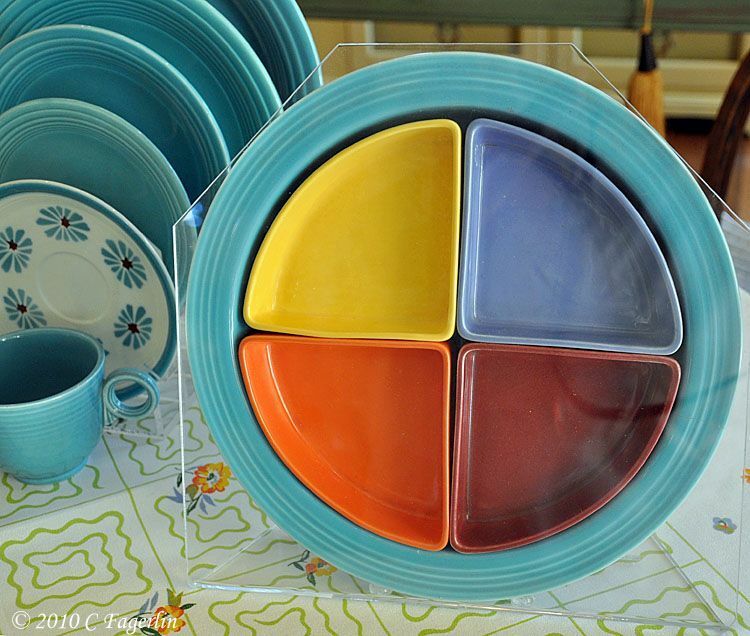 Several sizes of plates, from back to front: dinner, luncheon, salad, bread and butter plates. Vintage creamers in the ring handled version and the stick handled version. 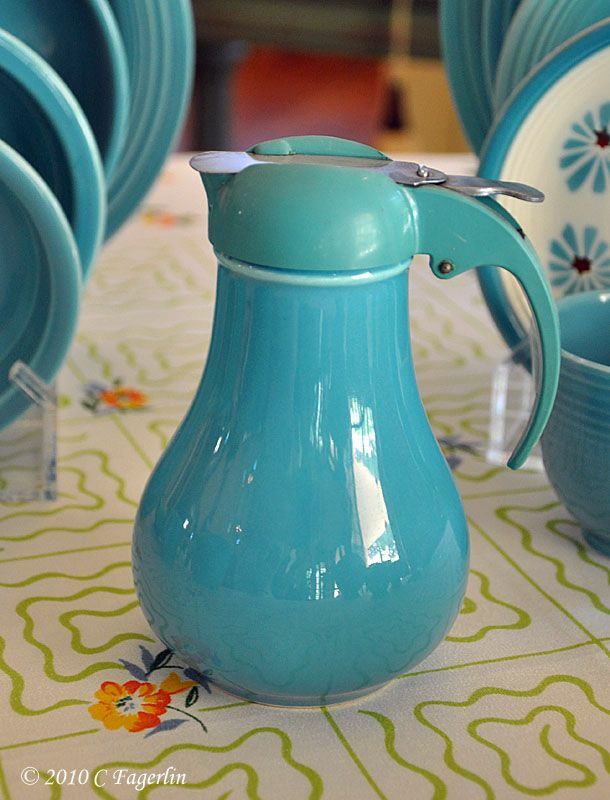 Vintage syrup - the only piece in the vintage Fiesta line that was not designed by Frederick Rhead. Homer Laughlin purchased the mold from the DripCut company, which also produced the lids for the syrups. The plastic lids tend to show discoloration from age. The syrups are only available in the first six colors of vintage Fiesta and Ivory is probably the hardest to find. The vintage relish tray comes in all turquoise also, but I've chosen to show the Harlequin version. 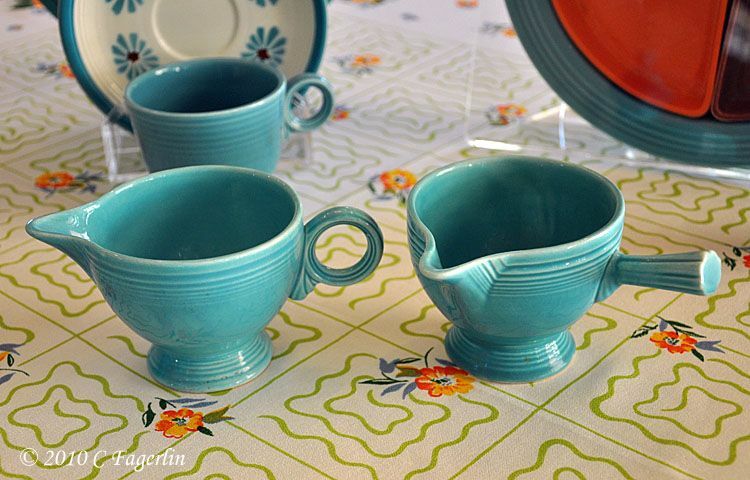 Harlequin was another line of dinnerware produced by Homer Laughlin. 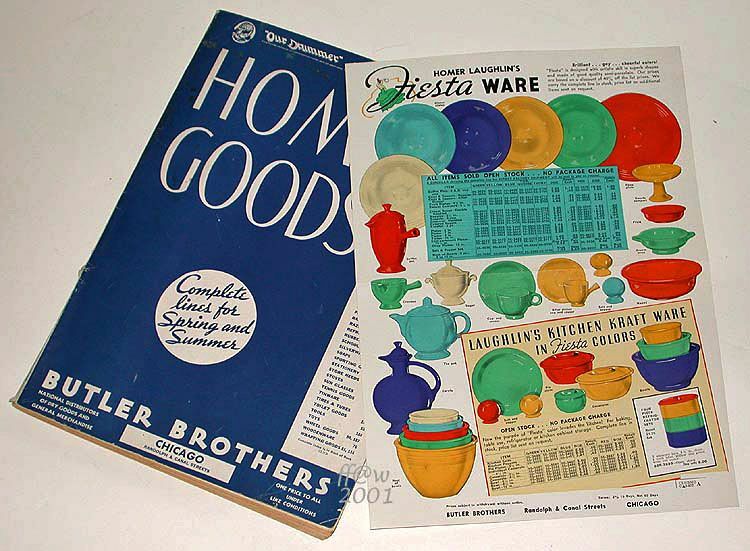 The base for the Harlequin relish tray was the same shape as the Fiesta relish tray, but the inserts are a different shape and size and used the Harlequin colors. You can see the difference by checking back on the Ivory relish tray shown last week. and I hope you'll stop back to check it out. I love that Fiesta! The Hawaiian decal saucer is darling! Thanks for sharing your wonderful collection. Just wanted to let you know that I gave you an award over on my blog today. Congrats! You have an incredible collection! Turquoise is my birthstone, so I really love these. Thanks for sharing! What a fabulous collection! 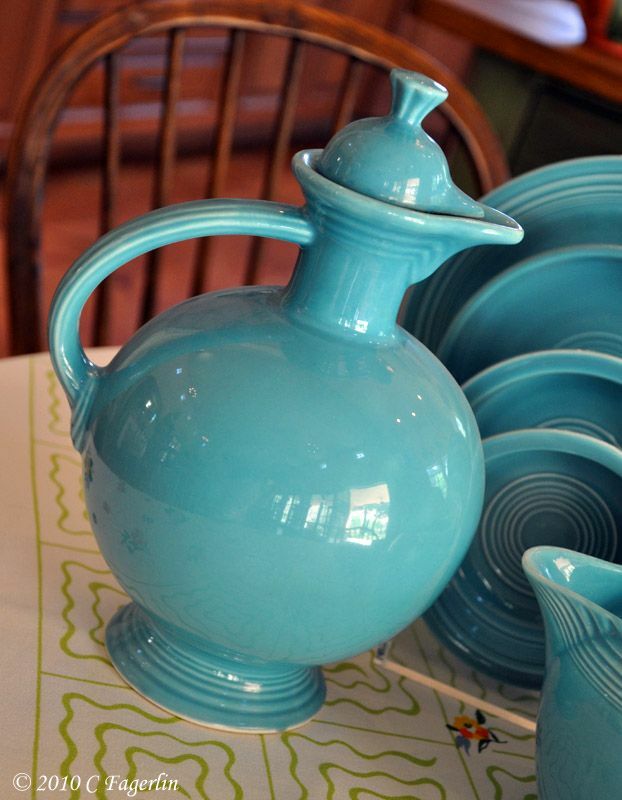 I love the shape of that carafe, what a great piece! So hard to pick a favorite but probably the carafe. Such vibrant colors too. I love your collection and your photos make it look extra nice. 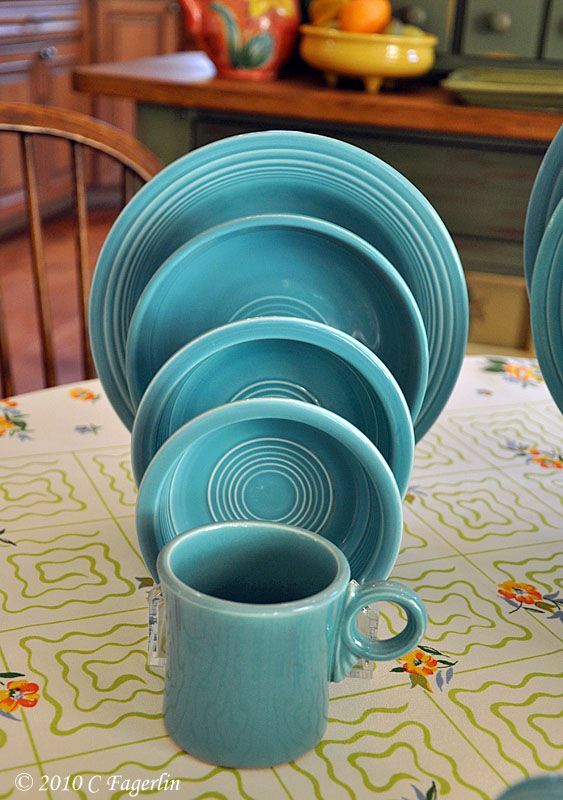 I have always loved the colors of look of Fiestaware. I have only a piece here and there, nothing coordinated. It just mke people smile. I am envious of your knowledge about it. I will have to investigate your other postings. 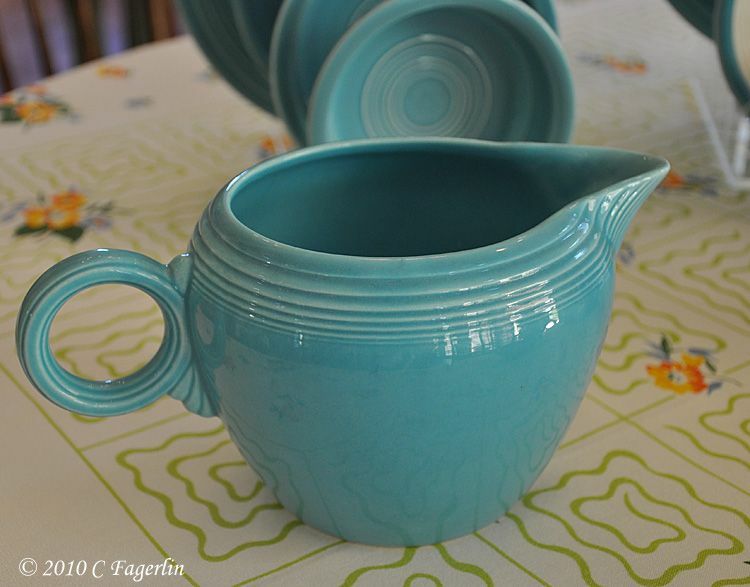 Beautiful Fiestaware...I think my favorite is the turquoise color. Happy VTT! Oh my! This collection makes my heart race! I definitely need to learn more about vintage Fiesta. I'll have to visit Pottery Papers for a closer look. My favorite is the carafe. And I'm intrigued with the Hawaiian decal saucer - I don't recall ever running across that pattern before. Thanks for this bright & cheery end to my day! I just LOVE the carafe. You have such a wonderful collection! Beautiful! Turquoise is certainly one of the colors of the day. again, another wondeful collection! love the colour and the unique shapes of the dishes.. the carafe is just rare! I love this post! 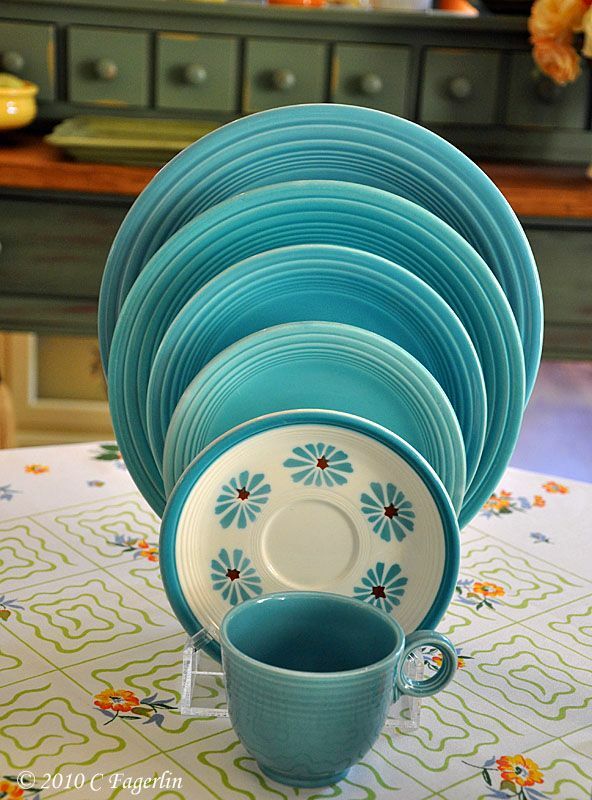 Your Fiesta ware is so charming and delightful, what a wonderful collection you have. I've never seen the harlequin relish tray before, so much fun. 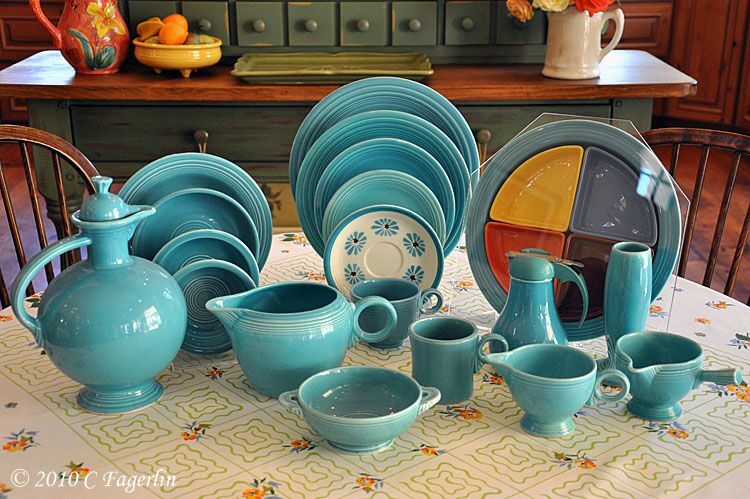 Thank you all for coming by to see the vintage Turquoise Fiesta! Next week, yet another vintage color to love!